5 Dec : For the first time in almost two years, the government on Friday slashed petrol price by Rs 5 a litre and diesel by Rs 2 and dropped broad hints of more cuts before the general elections are announced early next year. Petrol in Delhi will cost Rs 45.62 a litre from midnight tonight as against Rs 50.62 currently, while diesel will be cheaper by Rs 2 per litre at Rs 32.86. There will be no change in the prices of LPG (cooking gas) and kerosene. "In an interim measure, we have decided to cut petrol and diesel prices by Rs 5 and Rs 2 a litre (respectively)," Petroleum Minister Murli Deora said reporters after a meeting of the Cabinet Committee on Political Affairs in New Delhi on Friday. 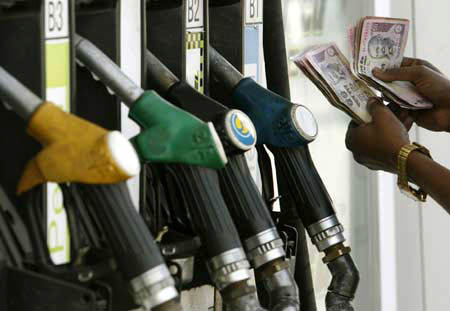 Auto fuel prices were last cut in February 2007 and were since hiked by almost Rs 8 a litre (petrol) and close to Rs 5 per litre as in the case of diesel.Before the price cut, state-run oil firms were making a profit of Rs 14.89 a litre on petrol and Rs 3.03 per litre on diesel and there were expectations that the reduction may be larger and some rate cut may also happen in domestic LPG. Petroleum Secretary R S Pandey said "This is an interim measure and we are working on a package (before the issue is revisited again)." Mechanism to compensate losses on LPG (Rs 148.38 per cylinder) and kerosene (Rs 17.26 per litre) would have to be evolved, he said pointing that the revenue loss on fuel sale this fiscal was estimated at around Rs 1,10,000 crore. The reduction, particularly in diesel rates, would further moderate inflation and help boost GDP growth by way of allowing RBI to increase money supply and in turn spending. Deora did not rule out another reduction sometime in January or February, saying "We will watch international oil prices and if they continue at current levels (USD 43.5 a barrel) we may think on those lines." "The government is closely watching the international oil prices and their impact on the country’s economy, and will take appropriate decisions whenever necessary," an official statement issued after the CCPA meeting said. "This (price cut) will help in reducing inflation," Deora said, adding that Prime Minister Manmohan Singh and Congress President Sonia Gandhi were committed to protecting the interests of the poor and middle-class. The government had in June raised the prices of petrol and diesel by Rs 5 and Rs 3 a litre, respectively, and that of LPG by Rs 50 a cylinder as crude oil climbed towards record high of USD 147 per barrel. International crude oil price has thereafter slipped to under USD 45 a barrel, which has been partly responsible for inflation rate cooling to 8.40 per cent. On Saturday, RBI is expected to ease its monetary policy stance and signal banks to lower interest rates, which will make borrowings cheaper, increase spending and push economic growth. "We have not raised price of kerosene by even a single paisa (during UPA regime). This is despite per litre losses on the cooking fuel soaring to Rs 27 per litre," Deora said. "India is the only country in the world where kerosene is cheaper than mineral water," he said.A litre of mineral water costs nothing less than Rs 12 while kerosene sold through PDS shops is priced at Rs 9.09 per litre. Petrol in Delhi cost Rs 33.70 a litre when the UPA government took office in May 2004 while diesel was Rs 21.73 per litre.Friday’s fuel cut decision will have a revenue implication of Rs 5,798 crore for oil marketing companies this fiscal, but will help cool prices of food items. Food articles inflation was hovering around 10.43 per cent for the week ended 22nd November, although inflation measured by wholesale prices was down to 8.40 per cent. Falling inflation will give room to the government and RBI to unleash measures to stimulate economic growth threatened by the global slowdown as also poor investor confidence following last week’s terror attacks in Mumbai. The government will on Saturday announce a fiscal stimulus for the housing, auto and export sectors, as also support for infrastructure sector.